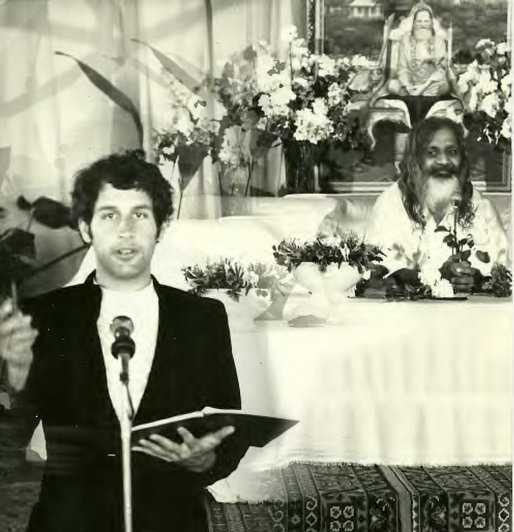 In the early 70s through a series of strokes of luck and fate I became the head preparer and then the chef in Maharishi's main kitchen in La Antilla, Spain, where MIU was then training teachers of TM. We catered to many vegetarians, but fish and poultry were also available because back then it was not common really to totally veg out, even among a thousand meditators. There were about twenty individuals with compromised digestive systems. Cooking for them was more challenging and I served them Vegan/vegetarian fare exclusively and they flourished. By the end of the course I could see weight gain and better health among 100% of them. The fish and poultry needed to feed the other nine hundred diners declined every week as they discovered the vegetarian entrees like spinach pie and chili, eggplant parm and other delights I knew how to concoct for them. Given a choice, I learned diners would naturally gravitate to the veggie side of the menu as long as ample substitutes were delicious and available choices. I was always mindful of a brilliant cookbook published a thousand years ago by Frances Lappe DIET FOR A SMALL PLANET which discussed proper protein portions in detail and helped me to balance the veggie choices correctly. If you don't tell them what they're eating is vegetarian, they often won't even recognize it. And told later, people are frequently surprised and delighted when they find out. Living with the neighbors' pigs running wild, I've grown to admire that species. They're intelligent, sweet creatures as are so many of the animals humans eat. I think it's their very docile natures that make them so easy to harvest for food. All humans are omnivorous by nature but so many actually thrive, lose unwanted weight, and get just as much happiness in life when they leave blood foods behind. Before that I had worked and lived in the Organic Morning Glory Message commune and magazine where I was exposed to considerable information about conservation and wholesome food. In my boyhood home of Alaska, we learned about the firestorms of weather coming early in the new millennium if we did not cure our ways. The scientific knowledge was not exactly suppressed. It was undermined with wave after wave of disinformation and propaganda that was friendly to industrial interests and developers. I am not exactly innocent. I thrived myself in a commercial world built on the pulp of forests. Saving feathers, the molted feathers of my birds and those of my friends and their friends, may not seem like a highly noteworthy pastime. But when you think of the millions of proud feathered creatures that have been slaughtered for their feathers for fashion, it gives pause. Consider a parrot. A good friend runs a parrot rescue. When people acquire them they seldom wonder what they’ll do when they get old. Parrots will frequently outlive their hosts, sometimes living to fifty or more. I want to contribute to my friend’s rescue, feed, money and other resources, and to other worthy organizations as well. In the first attempt to conserve and sell feathered art, we learned how difficult it is to make, display, store and sell artifacts. There had to be a better way. Then it hit me. Slowly at first I had the dawning realization I could use feathers in my art. I tried scanning them. But a better method turned out to be photography. It all came together because I was in college studying graphic design and art at the same time. We called the first ones in shadow boxes “feather paintings” so when I started painting digitally with the photographs of feathers, there had to be a new name. My work is informed and inspired by the funerary art you see from ancient Egypt. They “layered” feathers side by side either in paint or if the tomb was for an important person, they would use semi -precious stone and literally make jeweled artifacts they called “rishi”. So I decided to name my process feather rishi. The first incentive to make art with molted feathers came in the form of food. The donated feathers made into art could earn extra money. Now it is a much bigger concept. By creating a massive feather library and eventual museum of the digital images of feathers, there will now be less demand for the feathers themselves. The need will be met with digital licenses. Christmas 2013 and I feel very grateful. I had a 4.0 fall semester and the college has nominated me to represent them in a national scholarship event. Even if I receive it, I will still have a financial shortfall and have unmet challenges. Yet not everyone is so fortunate. I try to help when I can. Please say YES to feather rishi. If more boutiques say they like my designs and would consider carrying them I might receive the grant I need to start up my scarf boutique business. Thank you for stopping by. I hope this Christmas is a splendid one for you, your family and friends. Try to think of birds with the same affection you have for dogs and cats. They never disappoint with their moods or company. Birds are bright, sing frequently and they grace us with their molted plumes. Let's join together and protect their feathers in a database making it possible for everyone to access to their magic colors and textures.